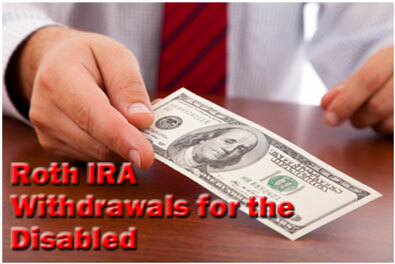 What about Roth IRA withdrawals for the disabled? Does the IRS allow you to make a penalty-free early withdrawal if you're disabled? If you meet the IRS definition of disabled, yes. First, if you're disabled, can not work, and need immediate access to your money, remember that the IRS does not tax or penalize you for withdrawing Roth IRA principal. But if you make an early withdrawal because you're disabled, you may qualify for an exemption from the 10% early withdrawal penalty. However, to do so, you must first meet the IRS standard for "disabled". So how do you furnish proof of your disability? To qualify for the special exemption concerning Roth IRA withdrawals for the disabled, you must have a physician determine your condition is "expected to result in death, or to be of a long, continued, and indefinite duration." In other words, you must have physician sign off on your condition. You can NOT self-diagnose. Your primary care physician should be able to fill you in on the details of this process. Once you qualify as "disabled" in the eyes of the IRS, you can make early withdrawals from your Roth IRA without being subject to the 10% early withdrawal penalty. Let's say you're 46 years old, and you're the primary source of income for your household. You have three children, and your spouse stays home full-time. You also have $157,000 in your Roth IRA - $55,000 in original annual contributions and $102,000 in investment gains. One day, due to the carelessness of another driver, you're the victim of a near fatal car crash which leaves you in a coma for several months. To make matters worse, you have no short-term disability insurance! As a result, your spouse looks to your Roth IRA as a way to keep current with the bills and pay the mortgage. Under IRS rules, since you "cannot do any substantial gainful activity" due to "a physical condition," and your physician determines that your condition is "expected to be of long, continued, and indefinite duration," you qualify for a special exemption applicable to Roth IRA withdrawals for the disabled. As a result, your spouse can make early withdrawals from your Roth IRA and avoid paying the 10% early withdrawal penalty. However, keep in mind, that you can always withdraw your original annual contribution amounts tax-free and penalty-free, regardless of your age or the reasons for withdrawal. In this instance, you have $55,000 in original annual contributions still in your account. Your spouse can withdraw the full $55,000 tax-free and penalty-free if necessary. Only the remaining $102,000 is considered an early withdrawal if taken out - an amount subject to income taxes, but NOT the 10% early withdrawal penalty. Of course, hopefully you'll remember to get that short-term disability insurance and none of this will be necessary. But isn't it nice to know your options, just in case? If you qualify, a special exemption exists which specifically applies to Roth IRA withdrawals for the disabled. This exemption allows you to make early withdrawals from your account without having to pay the usual 10% early withdrawal penalty. First, make sure you meet the IRS definition of "disabled". It's possible to meet the standard for "disabled" with other government agencies, while retaining a "non-disabled" label with the IRS. So make sure you meet the criteria. Only after the IRS deems you "disabled" should you consider taking advantage of this special exemption, and only under the guidance of a qualified financial professional.